On a recent visit to Monte Carlo, seeing the expensive yachts on display in the harbour made me wonder about how really rich people invest. Avoiding tax is probably an important part of it (otherwise, why would they all be squeezed up in that harbour) but the other tools of wealth management are probably closed to us ordinary investors...unless we can access them 'through the back door'. One route into the financial world of the rich and institutional investor may be via Intermediate Capital Group or ICG (confusingly it has the LSE stock ticker ICP) - a FTSE 250 company. ICG manages a total of €11.4 billion, including assets from third party investors and is one of the largest independent mezzanine providers in the world with investment portfolios in Europe, Asia Pacific and the US. ICG was established in 1989; as such, they claim to have one of the longest track records of any institutional investor in European senior loans and high yield bonds. 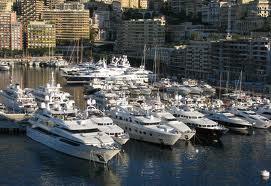 Now, to be one of their 'over 200' investors you would probably need to be an owner of one those Monte Carlo yachts. But another way into this market is to buy their shares, which are currently yielding well over 6% with dividend cover of over 2. However, as one reader has pointed out, the analysts on Digital Look forecast a 16% drop in earnings next year, although the forecast dividend is maintained. Although their funds are invested (partially) in property and in mainland Europe, if you believe the press releases, they are 'defensively positioned' and the portfolio is described as 'resilient'. Anyway, you can see the Annual Report here. Their investments are pretty well diversified by sector and country but they do admit: "The economic slowdown in Europe is providing a more challenging backdrop for cyclical assets." However, the company is performing well under its Key Performance Indicators and the investment track record seems good (18% Internal Rate of Return, 1.6x cash return). Update (2/9/12): ICG is also offering a retail corporate bond yielding 6.25% - rated a buy by FixedIncomeInvestor. Update (12/3/12): Sold at £4.078.